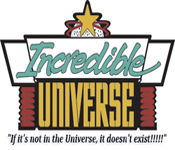 Incredible Universe was an American chain of electronics retail stores. Founded by John Roach in 1992. Intially two stores were opened one in Arlington Texas and the other in Wilsonville Oregon and when those turned a profit the Tandy Company quickly expanded the chain adding fifteen more stores. Of the seventeen stores only six were profitable.Those six were sold and the rest were closed in 1996.